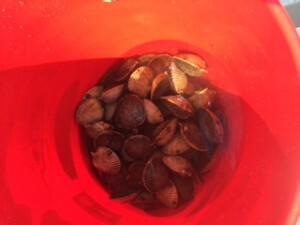 Scallop season is in full blast right now, with multiple limits coming to the tables. 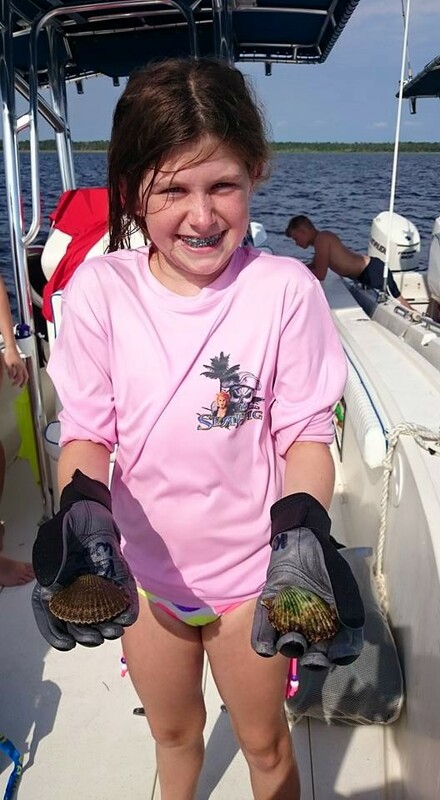 The recent rains have darkened some waters near the Steinhatchee River, so boats have been running some distance, but have found lots of scallops. Some of the hot areas recently have been around the Clay Creek trench, between Sponge Point and Keaton Beach, and some of the best reports have been from Dekle Beach, with scallopers picking up five or more scallops per dive to the bottom. South of the river, the area south of Pepperfish Keys, near the Pretty Pole, has been providing some good results as well. Keeping our fingers crossed for a slow-down in the heavy rains which should help with the water clarity. 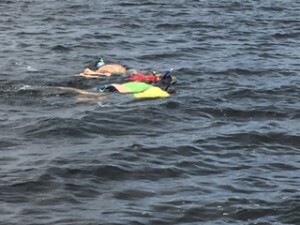 As usual this time of year, the fishing has been a little slow, especially for trout, which are holding in much deeper water (10 feet or more) over mixed grass and sandy bottom. While both gag and red grouper are in season, the grouper bite has moved considerably offshore, but had included some giant fish as you can see from the pictures. And this is one of the best times of the year for spearfishing grouper and hog snapper. Near the end of the month Capt. Tommy Thompson and I got into our summer fishing pattern, leaving the Sea Hag dock at 6 AM on a rising tide and fishing shorelines where we could find bait fish….and that was most places we stopped. Fishing points with schools of mullet and white bait, we found five nice redfish and were surprised by two fat 19 inch trout fishing topwater plugs. We fished three hours and were back at the dock just as the scallop hordes were heading for their limits. Here are some pictures from this month’s action at the marina. Capt. 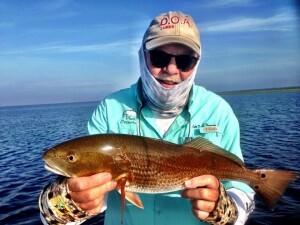 Tommy Thompson with one of five redfish we caught on an early morning trip. Capt. 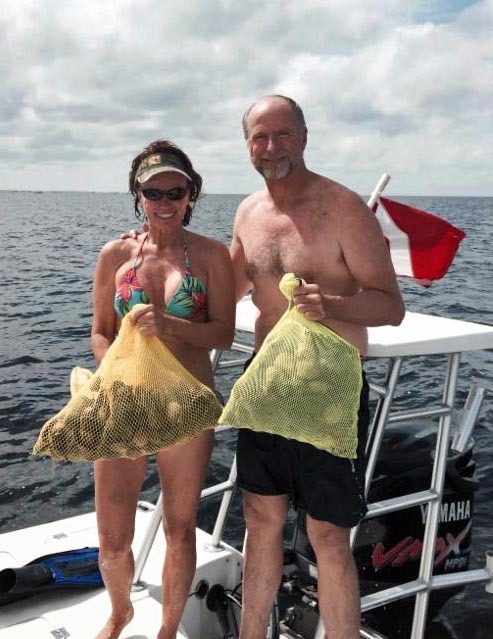 Leiza Fitzgerald took some time off from her job as director of the state CCA STAR tournament to capture some scallop limits with Lowe Morrison. 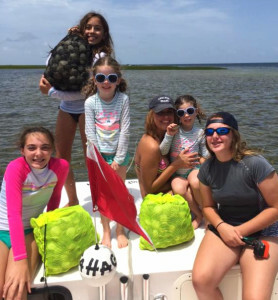 The Carrington and Elliot girls with multiple limits in their Sea Hag rental boat. Ray Hedgecock and Missie Schneider with a pair of winning gag grouper. 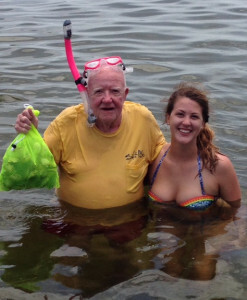 Uncle Bobby Crosby with his niece Candace Poole from Midway, Georgia with a nice bag of scallops. Rusty Ewing with a nice slot redfish. 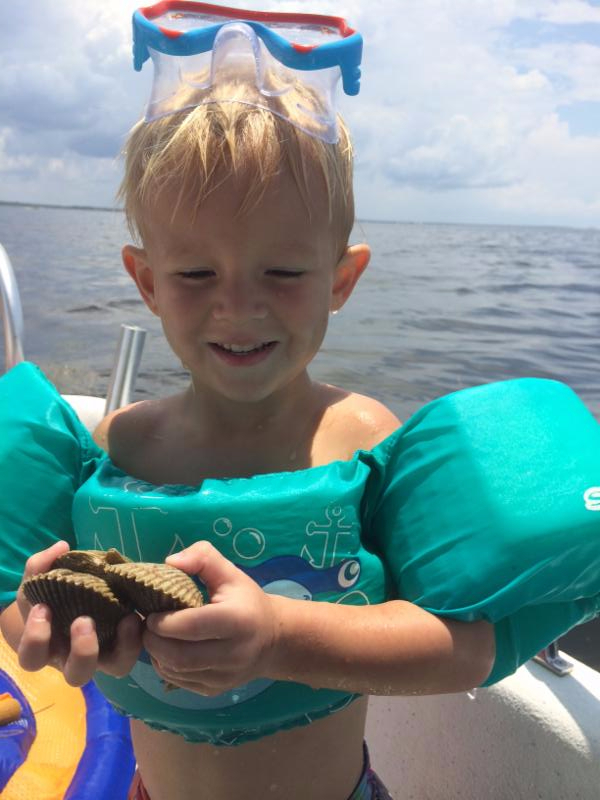 Colby Snyder on his first scallop trip. 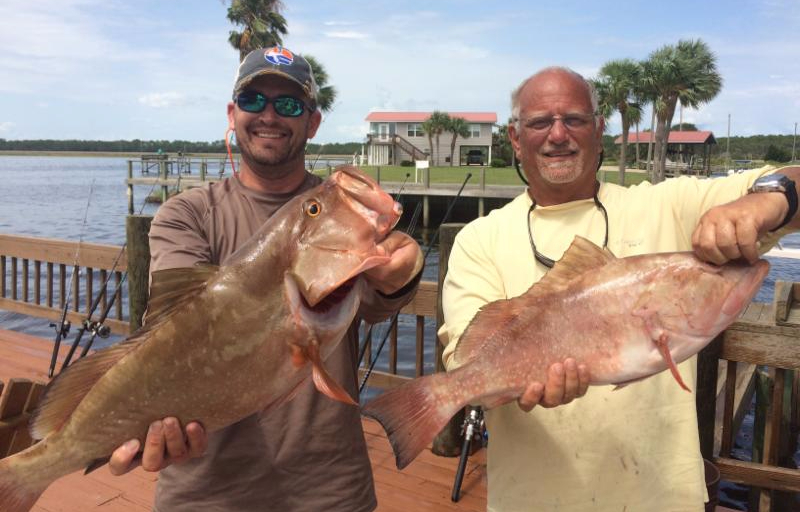 Jason Vinson and Terry Alexander with a pair of fine red grouper. Hannah Branch and her first flounder! Jade Green with a really big bag of scallops. Brad and Theresa Parrish with several gag grouper dinners. The Williams family scored big-time. 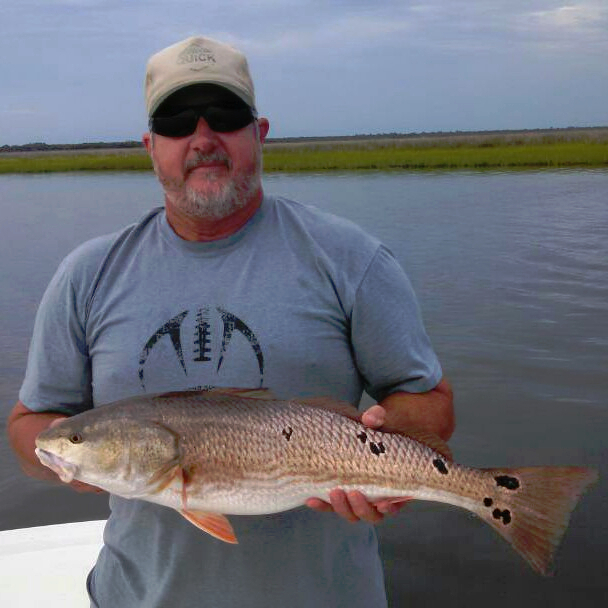 Keith Cooper and a fine redfish with lotsa spots. 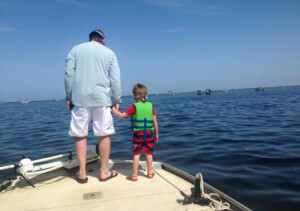 Andrew Brantley took his son on his first scallop trip. 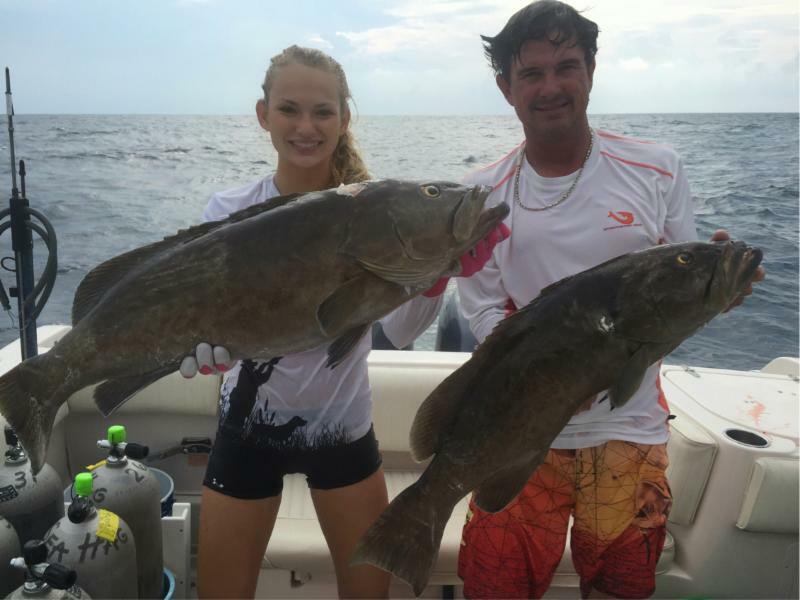 Spearfishing can result in some fantastic results…Chaeli and Charlie Norwood with some beautiful gag grouper. Jodie Parks really loved scalloping. 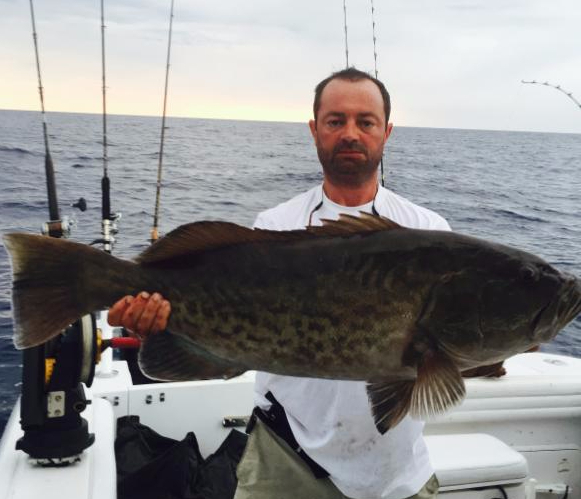 Randy Jones from Valdosta with a giant grouper. Let’s hope the rains slow down a little. Dark water is usually lower in salinity and not only makes the scallops harder to see, but also may make them move to deeper water. Right now, some scallopers are finding easier limits in 5-6 feet of water than in the usual 3 foot depths. While it’s easiest to find the “fleet”, sometimes exploring less crowded areas can be beneficial. A great way to scallop is to rent one of the Sea Hag rental fleet, 24 foot Carolina skiffs all set up for scalloping. 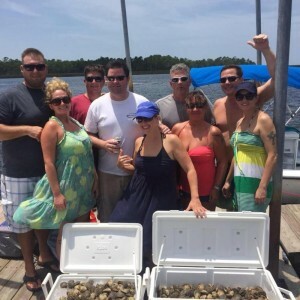 If you’re going to be in town for several days and don’t have any idea of where or how to scallop, consider hiring one of our guides for a scallop trip or a combined fishing/scallop trip. 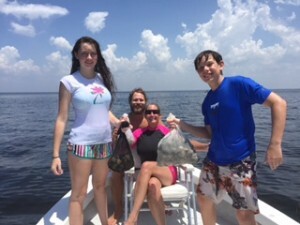 Everything you need for scalloping, from fins, masks and snorkels to fishing licenses can be gotten at the Ship’s Store. Make sure your plan includes reservations at the Sea Hag’s updated cottages, with the new swimming pool which is a great way to freshen up after a hard day on the water. 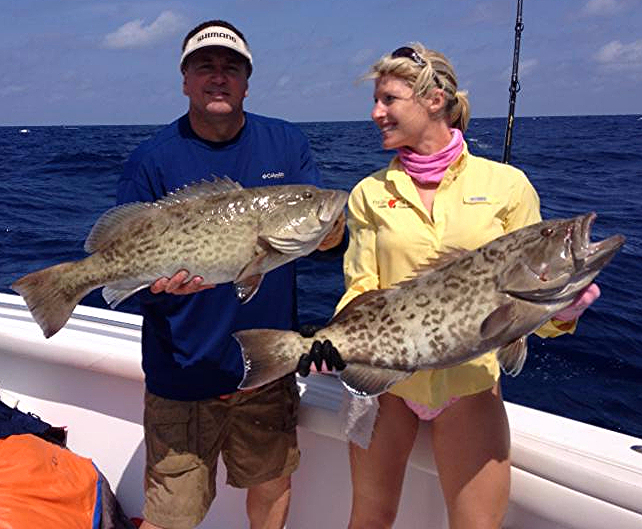 In terms of fishing, grouper are the primary target this time of year. 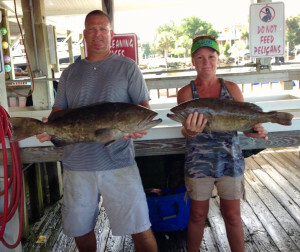 Instead of the usual 35-45 foot depths, the best grouper bites have been a bit further out, from 50 to 60 foot depths. Live pinfish have been producing well, and spearfishing is very hot right now when fish are located. Amberjack are closed until August 1, and the news there is that the minimum length for amberjack will increase from 30 inches fork length to 34 inches fork length. Inshore, trout continue to be a challenge. Some nice fish are available very early in the morning around bait in shallow water, but as the sun comes up the fish are moving to much deeper water. 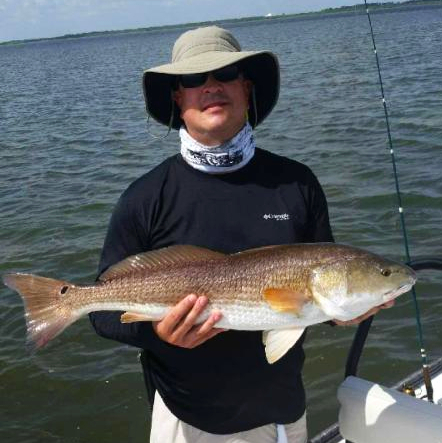 Redfish have been available but a little inconsistent. 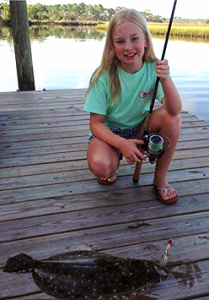 Again, look for lots of inshore bait around shorelines. When you find an area with small whitebait and moving schools of mullet, you’re in the right place. 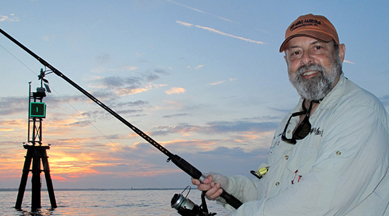 As every year, we can expect the inshore fishing to improve near the end of the summer, but persistence can provide some nice fish throughout the next few months. 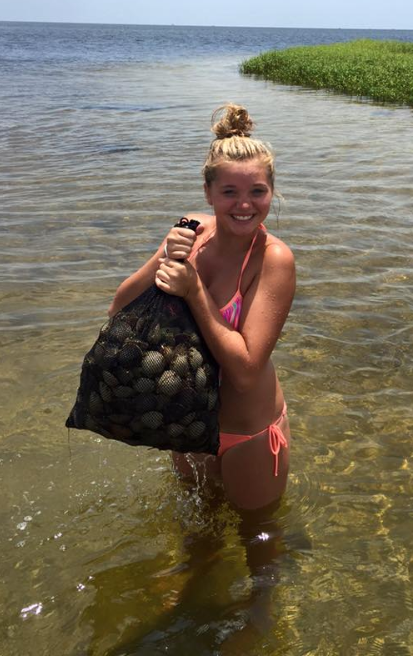 We are over a month into scallop season and we are easily gathering our limits on each trip! As you can see in the photos the scallops we are gathering really have some size to them! Scalloping is a great family adventure for young and old alike. Give us a call at Hooked on Reds. Our best guess is August will be a great month to enjoy the beauty of our pristine waters as well. 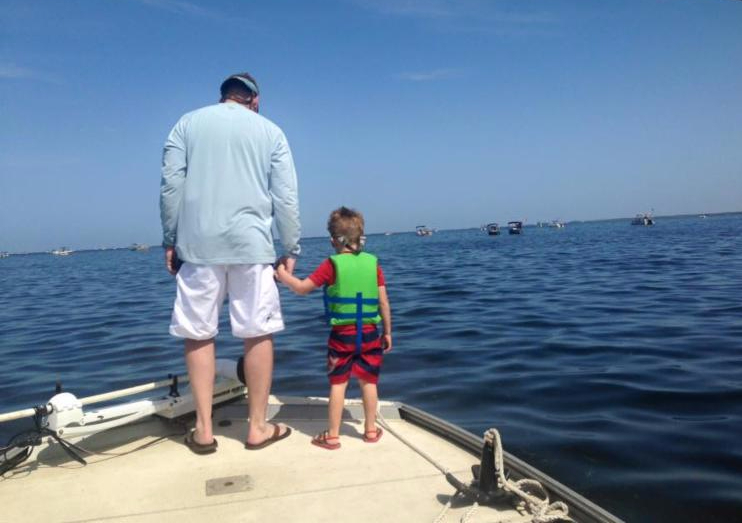 If you enjoy fishing … some of the best fishing is right around the corner. Book early before all of the best dates are taken. A special thank you goes out to all of the folks we have served this season.